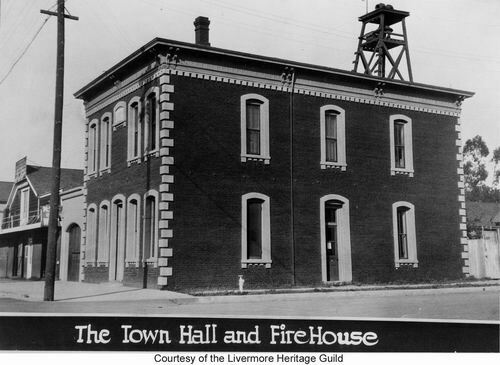 Built in 1882, it was the Bank of Livermore from about 1883 to 1890. 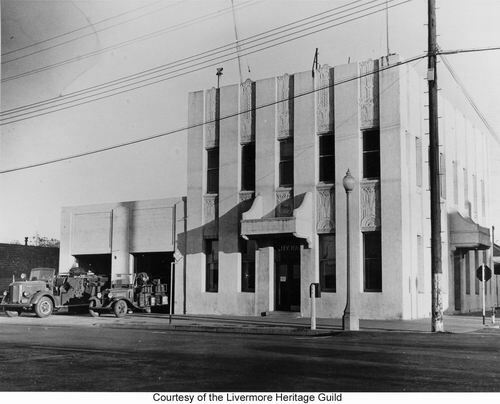 It was the Livermore City Hall from 1905 to 1957, at which time city hall moved to the Bank of Italy Building. 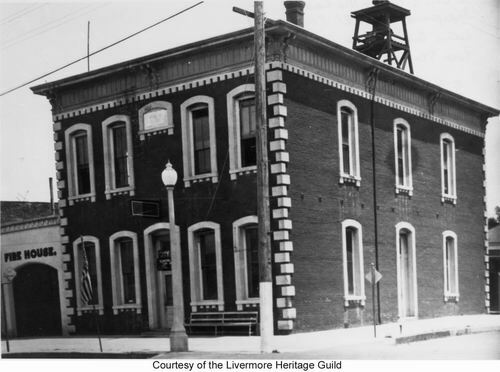 It was a fire station from 1906 to 1976, and housed the Centennial Light Bulb until 1976. 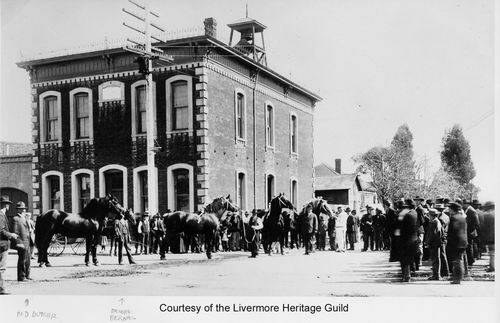 It was also the Livermore Police station from 1906 to 1974, with the jail in back. East 1st Street. This picture was taken in 1896 from the McLeod building, (which was being used as the Masonic hall at the time), looking east (the photo inscription is incorrect). 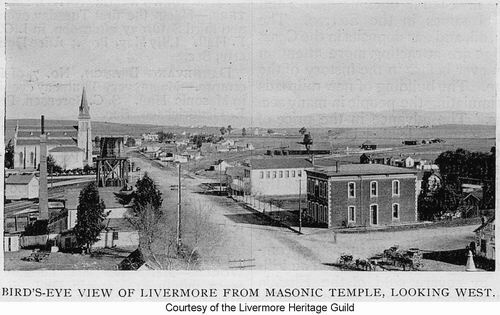 The building on the right is Independence Hall (the Bank of Livermore at that time). St. Michael's church (original location) is on the left. It burned down in August 4, 1916. The SP railroad tracks run at an angle, crossing 1st St in front of the church. On the south (right) side of 1st on the far side of the tracks is the remainder of Laddsville, most of which would be behind the church. Laddsville burned in 1871, destroying most of the structures. This is only only known view of Laddsville, other than a few photos of businesses (see photos). The bottom right corner of the photo (SW corner of McLeod & 1st) is the future (now former) home of the Sweeney Opera House (see photos) which existed from about 1904 to 1945. At the left near the bottom is the Diamond Flour Mill (see photos), constructed in 1884, with the smoke stack for the power plant behind it. Independence Hall with a horse show in progress. N.D. Dutcher (of Dutcher's Hardware) and Dennis Bernal (Livermore Brewery) are pointed out in the photo. Note that the bell is in place but not the sirens. The building looks weathered in this picture. Sirens are in place here. The building appears to be cleaned up in this picture. Looking slightly more weathered again. This is probably latest of these three. The utility pole has been painted on the bottom, a Street light and street sign have been added. The fire house is now labeled. This is the same building after renovation by the WPA in 1936. The windows are very different, and there are 7 rows instead of 3 on the west side. The fire station has two bays. The same street light is still present.